What Happens When You Brush Teeth With Baking Soda And Sea Salt? Have You ever thought to brush teeth naturally? 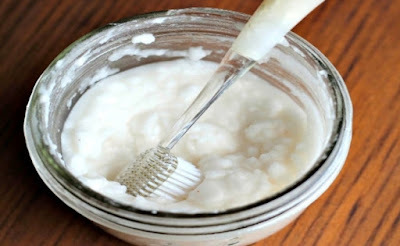 If you want to have pearly white teeth do not use all those commercial toothpastes. Brushing your teeth with baking soda and/or sea salt can do a lot for you. It is natural and safe way to ensure white and strong teeth. It can easily break down plaque buildup, and what is maybe most important it protects against bad breath. Either you use only sea salt or in combination with baking soda (sodium bicarbonate) these treatments for tooth care are very effective and inexpensive. Magnesium, calcium, silicon, sodium, phosphorus, iron, nickel, iron are only few of many tracing minerals and elements that we can find in sea salt. These nutrients protect against tarter, strengthen gums, and protect against bad breath. Over time it may even whiten your teeth. Sea salt is high in iodine and it has antibacterial properties. It also helps neutralize acids in the mouth. Salt has the power to make us salivate. Our saliva creates an antibacterial barrier and therefore protects our enamel. Take half teaspoon of sea salt and dip a wet toothbrush into it. Brush your teeth as you regularly do. Also you can rinse with a saltwater solution. Mix 4 ounces of warm water and ½ teaspoon of sea salt. Let the salt become a solution for a moment, and for about 30 seconds slosh the solution around in the mouth. When done, make sure to spit and not swallow it. A saltwater rinse helps allay inflamedand swollen gums. The bacteria in the mouth will go away. Brush Teeth with Baking Soda? Baking soda is natural remedy for teeth whitening. It’s enough to clean the teeth of plaque and tarter and it does all of that without being so abrasive. This is very important for our bones. Sodium bicarbonate or baking soda is an alkaline element, and as such “fights” or counteracts acids in the mouth. This is also very important information to know because acidity actually causes tooth decay, combats bad breath, and kills bacteria and germs. To clean teeth only mix water with baking soda into a paste-like consistency. You can also combine salt and baking soda to make your own natural, cheap homemade toothpaste. If you don’t want to “quit” your traditional toothpaste completely, brush teeth with baking soda and sea salt once or twice a week. It will be supplemental dental treatment and care. Are there any side effects of this natural remedy? According to the clinical investigator at the National Institute of Dental Research, Dr. Paul H. Keyes D, NO!